It’s true, I won a Pulitzer Prize. 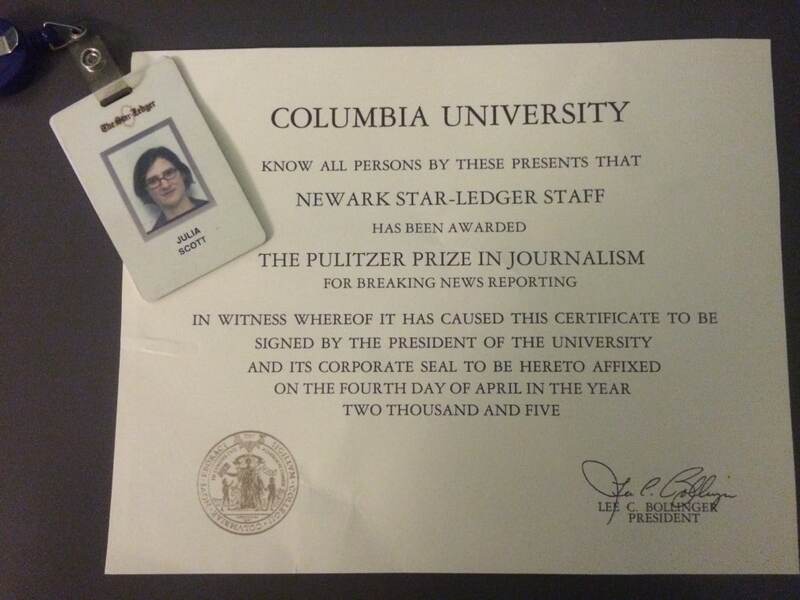 I was a cub reporter at the N.J. Star-Ledger in 2005 when we got word that Gov. James E. McGreevey was going to make an impromptu speech. I didn’t cover state politics. I’d only been to the capitol, Trenton, once. But my editor insisted we all watch the speech. He certainly knew more than he was sharing. We tuned in. McGreevey was unexpectedly resigning. But that wasn’t the real story. He could have left office and faded from view. But McGreevey made a bold choice that day. I still remember the line. McGreevey was resigning because he had installed his gay lover in a six-figure position in his administration. (The love affair part is contested, depending on who you talk to.) At the time, not a single American governor was openly gay. McGreevey’s scandal made him the first. Three months before his speech, Massachusetts became the first state to marry gay couples. The same day as his speech, California was forced to halt gay marriages until the courts could sort the matter out. So McGreevey announcing he was gay was a big deal. The newsroom burst into action. The morning sked – put together within an hour of the speech – had a dozen McGreevey stories. (A sked is newspaper speak for the list of stories that will run in the next day’s paper.) The breadth of the McGreevey coverage was breathtaking. Even in my bureau, you could feel the newsroom roaring. So what was my contribution? I staked out McGreevey’s new bachelor pad in a swanky apartment building in Rahway, NJ. It was me and a photog (Pronounced: FO-TOG) from the New York Post hanging out. He wanted a shot. I wanted a quote. We got neither. So after several hours of waiting (note to self, next time you go on a stakeout, pee first), I talked myself into his new apartment. The sales agent was very courteous about showing me around. I saw the empty apartment just below McGreevey’s with the same layout. I got a bit of color, wrote up a few grafs for my editor, who sent it onto a reporter in the main office who was writing the story. My name appeared as a contributor at the bottom of the story. I was one of many reporters who covered some aspect of McGreevey’s resignation and we all shared the 2005 Pulitzer Prize for breaking news coverage. It was an honor to be part of the team.